One of Australia’s favourite breweries have have teamed up with one of Australia’s hottest live bands for a series of exclusive live shows. 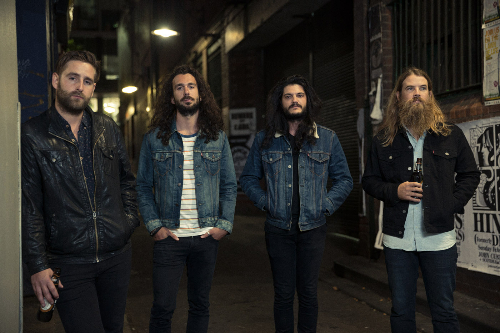 Melbourne band Kingswood have joined forces with Adelaide beer Coopers Dark Ale to rock the Coopers After Dark national tour. Kingswood have had a massive year, debuting at number six on the charts with their Microcopic Wars record, securing two places in the Triple J Hottest 100 and enjoying sell out shows and festival lineups at the likes of Falls Festival and Splendour In The Grass. Since 2009, the band has played through dingy pubs and clubs to iconic rock venues and on their way have developed a signature sound and an explosive live act that draws fans out after dark on even the coldest of wintery nights. Coopers National Sales & Marketing Director, Cam Pearce is thrilled about Kingswood’s partnership with Coopers for this tour and is keen to give his support to live Aussie music. “Live Australian music belongs in Australian pubs alongside Australian-owned beers. As our largest family owned brewery, we’re proud to get behind bands like Kingswood who are giving it their all and succeeding, not just here, but also internationally,” he says. After the success of last year’s partnership with British India, Coopers After Dark has become an annual event bringing together crafted Australian music with crafted Australian beer. Hot on the heels of their Microscopic Wars II tour, Kingswood will set off for six exclusive shows across six cities, giving fans the chance to experience the awesome that is a Kingswood live set in some of the country’s best live music venues. To get tickets to one of these shows, you have to purchase a six-pack, carton or glass of Coopers Dark Ale and enter online. Coopers Dark Ale drinkers can win four VIP tickets to an exclusive Kingswood gig and there are hundreds of tickets to be won instantly at CoopersAfterDark.com.au. Each gig includes complimentary food and Coopers Dark Ale. Posted in Music, What's on in Adelaide and tagged Adelaide, Coopers Dark Ale, Kingswood. Bookmark the permalink.